Note that this isn’t any paid post. I’m just taking part in testing the tool and helping my friends over there with data to help ameliorate their business. Semantic SEO (Google’s knowledge graph) is simply optimizing your content for true intent of your readers. It involves adding more related words and meanings to your phrases. In other words, it’s the practice of writing content search engine optimized around topics, not just individual keywords. Brian Dean refers to this as creating “topically relevant” content. Semantic Search is trying TO understand topics, not just individual keywords. The best way to create in-depth articles is to focus on your content semantics. Without tools, this may become so difficult. While testing textoptimizer on one of my existing articles, I took it from 800 words to over 1400 words. The tool helped me with more meaningful words and some crazy long tail keywords that expanded the content to far above my imagination. Before running the tool, the article was optimized at 51% which was quite low. A recommended optimization level by the tool is 80%. At the moment, you are able to optimized for two search engines: 1) Google and 2) Bing. The reason is that search engines function differently. My experiment this far has been with Google. The next step after selecting the search engine is to enter the keyword. The keyword should obviously be the main keyword you want to rank for. Additionally, the tool gives you a couple of related key phrases you may rank for. On the next page, if your article is already published, just click to enter the URL or copy the article text and paste in the “Paste in text” option. Your final page should give you a long list of semantic keyword suggestions to add to your post. From the experience I got, these words are super relevant, giving a vote to the tool. The words and phrased on grey background are words you’ve already used in the text. Those on white backgrounds are words that are proposed by the tool. It’s up to you to be able to get the best keywords on the list properly phrase them in your document. Keep refreshing the page after adding the words to your document until you are given an 80% and above. What about the format of your text? The tool at the moment does not end at page semantics. It looks at some more areas of your page that may influence user experience and search rankings. I think this tool is one of the Keyword research tools you should have to develop a result-driven content marketing strategy. It’s actually a keyword suggestion tool that bases on your already existing content. Keyword stuffing vs Semantic Keywords. Keyword stuffing is black hat SEO. It’s the practice of sprinkling same keyword all over your document, trying to manipulate search engine rankings. But semantic SEO is not keyword stuffing. It’s about using related, LSI keywords in your document. It’s white hat SEO and should be practiced without fear of any penalty. Semantic SEO is a phase in the machine-learning artificial intelligence called Rankbrain, introduced in 2015 as an upped game on Hummingbird. Google is gradually replacing traditional SEO, focusing on interpreting and understanding search intent. Semantics is Google’s intelligence at trying to understand human language. If you are an SEO agency, current changes and development in the industry spin a warning signal for you to revisit your SEO techniques. Basically, while keyword stuffing focuses on keyword density, Semantic SEO deals with diversity and relevance. Search engine optimisation is a broad topic and painful exercise in online marketing. Keywords research, backlinks, server optimization, mobile seo and contents are the key elements you hear about when giving some time to search marketing. But we are in an age when the industry is undergoing massive and constant upgrades. Focusing on backlinks (building or buying them) may not produce the result to match the effort. The first two ranking factors are: Links and Content (difficult to say which comes first). But Rankbrain is generally accepted to be the third. If you build tough backlinks and carry shallow and irrelevant content to first position on page #1, trust me Rankbrain will kick you out by reading the reaction and behaviors of your unsatisfied readers. If you must celebrate a successful content strategy, you must have semantics at the center of it. Many content and keyword research tools are today upgrading to not disappoint their users. One question I ask myself is what is the relationship between structured data and page semantics? Quickly, both help Google in ranking your entries. Structured data are added directly to your page’s HTML markup from the database. Search engines use this information to generate rich snippets, small pieces of information (hours, stars, pricing, etc) displayed in search results, next to a website and meta description. The days to manipulate search ranking are gradually fading out. Building links randomly from low and high pagerank domains may not bring any seo results in the years to come. On page optimization is gradually leading the SEO ranking factors. Google knows it has to drive website traffic to relevant content. That could explain the numerous algorithmic updates all focused around filtering out trash from SEO results pages. Due to uncertainty and fluctuations in the industries, many webmasters and folks involved in web marketing are now complimenting with pay per click advertising. Paid search drives relevant web traffic in internet marketing. So I vote for Adwords and any form of marketing strategies that allow you drive paid traffic from search engines. Seo Experts have recommended many different Seo tools. Don’t forget Google Webmaster Tools (today known as Google Search Console). It helps you find out what’s already working for you so you can focus on them for better results. Watch the quality of your inbound links. Some links are flat-out toxic and can harm your Seo campaigns. You may want to hire an seo consultant to handle the activity for your firm. Do some Guest Posting for backlinks. Remember Matt Cutts’ statement on this was reacting to the way it was practiced back then. But today, it’s a clean way to build authoritative links, push your Google ranking to page #1 and increase traffic. I often prefer renown seo professionals to some random seo companies. Most companies offer poor seo services, linking your domains to low quality content. My take is you do proper investigations on any seo company before any engagement. I know this was a quick read but I certainly will be updating on my experiment with time. You may want to give this tool a try. But I want to emphasis the need to pay considerable attention to SEO best practices for any online marketing campaign. Tricking Google and other other search engines may yield momentary or short term search engine ranking boost. But long term results are always disastrous. Protect your organic traffic and build a sustainable business through semantically created content. Your semantic SEO strategy must be based on trying to understand and predict intent. We know keywords can be manipulated but search intent remains intact. Super stuff Enstine. 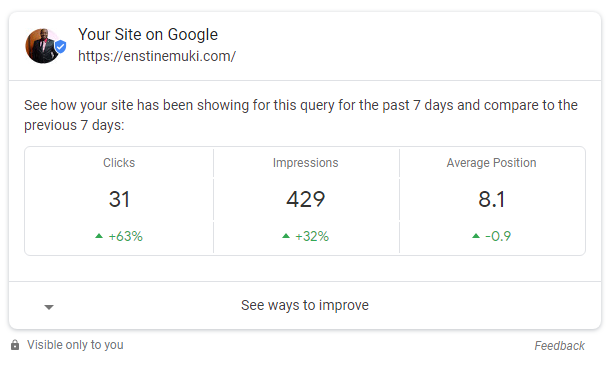 We can do this in an organic fashion without working crazy for backlinks. Smart approach works across the board with our blogging campaigns. I’m doing my experiment and will share my results in a few weeks. this Text Optimizer tool look very promising. I really like relevancy building because Google as a machine needs all the signals you can feed it, and for all keywords you want to be ranked for. So, that’s a chance because you can let others fight for every link and you can simply choose a roundabout way and leapfrog those link mongers. Ranking today is not about raw link power, it’s more nuanced and relevancy is a big part of the puzzle. You know it’s still not clear which is first: Links or Content but I think content should carry the vote. Will surely share some data in the coming weeks. Thank you for the post. Really useful stuff. As a beginner this is the first time I’m hearing about semantic seo. I’ll definitely give your strategy a try and see how it actually works out for me. Ray recently posted…Teer | Teer News | Teer of Shillong | What is Teer ? Thanks for the comment. I look forward to hearing about your experience with the tool. Thank you for this Enstine – I’m currently giving it a try. Good luck! Hi Enstine – I followed your instructions over a 4 week period – using the Text Optimiser tool as well as Googling for “words related to …”. I have seen a massive (yes massive) improvement on my rankings for reasonably difficult search terms but focusing on “People Carrier Hire XYZ Airport). I now rank on Page 1 Google for at least 19 world-wide airports – but as of yesterday I ranked #1 Page 1 for “People Carrier Hire Orlando Airport”. I took a screen print which I can send, as obviously the rankings change on a daily basis. I now monitor a selection of search terms and react to any loss of rankings, to try a sustain Page 1 presence. I think that this shows with a bit of thoughtful research, a bit of sensible inventive content and with a lot of hard work – SEO is not such a black art. Do you mind sending the image to me by mail to contact@this domain? Wow! It looks an incredible tool for Long-Tail Keyword SEO, there a lot of traffic opportunities with low competition keyword. Yes you are right. Long tail and low competition can drive crazy traffic. Search engines are indeed becoming smarter and keyword stuffing doesn’t seem to work nowadays. I’ve been updating my old posts and I should try semantics on them. Thanks Enstine for sharing! Will surely give it a go ahead! So true Sematic Keywords optimization is the new SEO. And I have tested text optimizer. Great tool. Currently updating my articles. Thanks for sharing your experiences with us. Thanks for the great share. I will surely be trying it. Keep it up and keep sharing good stuff like this. The exact features that TextOptimizer is providing, is similar to that of SEMRUsh SEO Writing Assistant Plugin. I tried TextOptimizer for my homepage and for a particular keyword. It showed that my content is already 89% optimized. LOL! My link doesn’t even rank for that keyword. You know it’s just telling you the optimization not ranking. And 100% doesn’t mean you will rank because there are several other factors. But optimizing would always bring some improvements. Are you fully using SEMrush? Yes, I do accept there are so many factors behind ranking for a keyword. The point I am trying to convey is that we need a tool that can predict whether with this content and with this website, will you be able to rank on the first page for this keyword? Such a tool will save a lot of money and time for everyone. I don’t use SEMRush fully. Right now, I am on a free plan. For around 3 months, I was using the PRO package and identified website problems to optimize it. After fixing up all the basic issues with the site, I have downgraded the subscription. Yes SEMrush’s site auditing tool can tell you this. It analysis your pages and gets the 10 competitors on first page of Google, then tells you what they have done to be there and what you should do to kick them out. Pretty nice stuff huh? Thanks for coming back to continue the conversation.